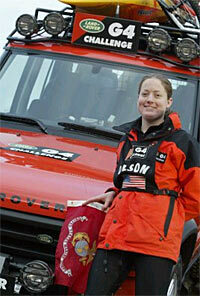 Eastnor, Herefordshire - At the end of a grueling five-day training and assessment program, Nancy Olson, 29, U.S. Marine Corps Officer, has emerged as the competitor who will represent the United States in the 2003 Land Rover G4 Challenge. Despite intense competition from her fellow American Kirk Boylston, 45, Olson won through and will now undertake a training and preparation program in readiness for the rigors of the Challenge itself. The event kicks off in New York City on 30th March, with 16 competitors enduring four consecutive weeks, four time zones and intense physical and mental competition. The International Selections event took place at the 5,000 acre Eastnor Castle estate, home to the Land Rover Driving Experience and a world-renowned center for off-road driving excellence. During the program, which ran from Sunday January 19th through Friday January 24th, a total of 32 prospective competitors, two from each of 16 participating countries, were put through a series of demanding assessment sessions, including GPS and navigation, off road driving, mountain biking, climbing/abseiling and kayaking. The purpose of the event was not only to select the final competitor for each nation based on quantitative scoring systems, but also to train all 32 competitors in each discipline to give them all the skills and knowledge required to complete the Challenge safely. In the event of the selected competitor being unable to take part, the reserve competitor will step in to fly their national flag. Olson was overwhelmed to learn of her selection, "This entire experience from National Selections to International Selections has been the experience of a lifetime for me. When I signed up for this on the Internet I really didn’t know what I was getting myself into. It all sounded good but no words can describe the actual experience. It has been amazing meeting with everybody from all these different countries, they are wonderful to work with and we have all come together and bonded as competitors but also as friends." For further details of the Land Rover G4 Challenge and to follow the action online from March 30th to April 26th, visit www.landroverG4challenge.com.